After Indiana State University student Crystal Garcia and Monica Block studied in Costa Rica, they wanted to make sure their once-in-a-lifetime experience wasn't just once this lifetime. They were part of a group of four Indiana State students who visited a shelter organization in San José, Costa Rica, for two weeks in December. The group spent the two weeks visiting with the children at the organization, teaching them English and health tips. They also gave the organization a variety of items that had been donated by people and groups from Indiana State and the Wabash Valley specifically for the Fundación de Misiones Mi Tia - Betel, the full name of the organization. "It seemed like almost anybody that we talked to about it was willing to offer something," said Block, who first visited the foundation while studying in Costa Rica at Universidad Veritas. 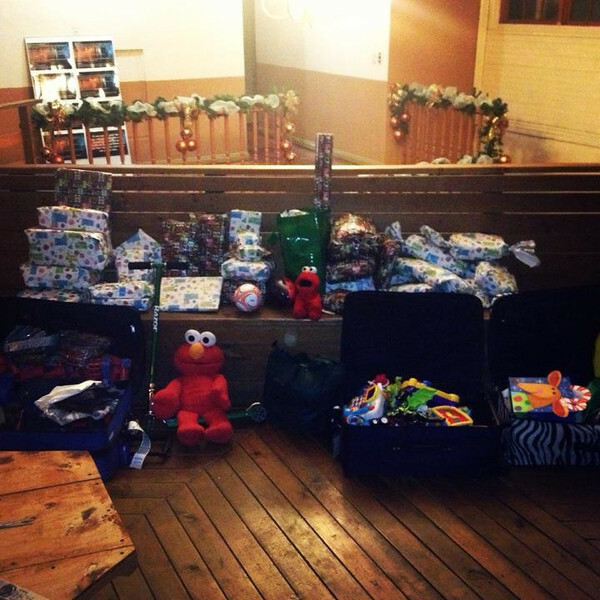 "A lot of people donated toys ... and groups on campus donated money." The idea for the trip came about when Garcia, who has traveled back to Costa Rica since studying abroad, wanted to collect donations for the foundation. She discussed the idea with Nicholas Penington, a junior social work major from Indianapolis who is president of the Student Study Abroad Organization at Indiana State. They considered going to Costa Rica to deliver the items they could collect, along with helping the organization in person. "Some days we were just playing with the kids all day, teaching them basic things, and it was through play that we did it as well," Penington said. "We tried to keep it practical for the kids. We wanted them to know that we are interested in them, we are invested in them. "Some of the donated goods included items from local Wabash Valley businesses and included clothes and soccer equipment, said Janis Halpern, director of the Study Abroad Office at Indiana State. While she helped them with some aspects of the trip, the students planned the entire trip by themselves, raising the travel funds and collecting the items. "All around, I thought it was a wonderful idea that the students came up with, and I think a lot of that comes from the spirit here at ISU that community engagement and doing something for the community is important," Halpern said. "They just took it one step further." The group even received support from other groups and people in Terre Haute. Students in a second-year Spanish class at Terre Haute South Vigo High School, where Block was student teaching, each wrote a letter and sent gifts to children in Costa Rica for the trip. Lauren Hensley, another Indiana State student who participated in the trip, helped organize a fundraiser at Beef O'Brady's restaurant, along with working with numerous organizations at Indiana State, such as Union Board, for donations. The students received funding from several offices and groups at the university, including the Center for Community Engagement, the social subcommittee of the Black Faculty and Staff Caucus and a grant from the Office of Diversity. The project, which was a community service project abroad, was incredibly unique and different from many initiatives that the office receives, said Elonda Ervin, university diversity officer at Indiana State. "It doesn't have to be so cut and dry that it has to be a program on campus that draws diverse students," she added. "They were really thinking outside the box, which is why we really wanted to support them." Garcia and Block speak Spanish, which facilitated the group's communication with people in Costa Rica. Yet while Penington and Hensley could not communicate as easily, they still were able to work with the kids at the organization, who range in age from 2 to 16. The organization serves as a daycare for the children of working mothers, and the organization houses women and children, said Block. Some of the children are orphans, she added. While the Indiana State students taught the children, each college student gained something from the experience as well. Block, a senior language studies teaching major with a concentration on Spanish and focus on teaching English as a second language (ESL), practiced speaking Spanish and and translating for other group members. Penington said that he gained a lot of experience that he can use in the social work field. "Working with the kids was phenomenal," he added. "I wouldn't change it for the world." 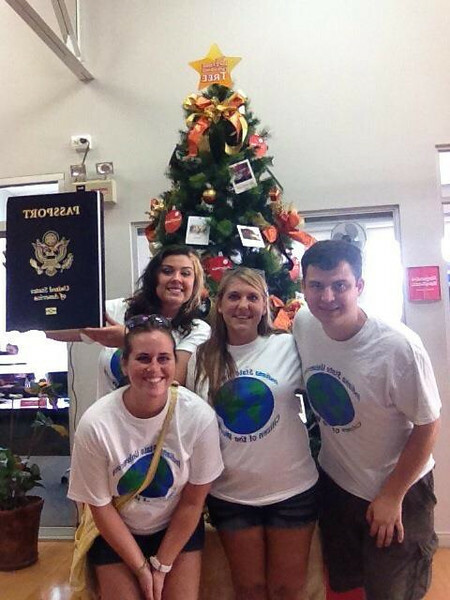 They are planning for the trip to become a tradition for the Student Study Abroad Organization. The students didn't start planning the trip until just a few months before leaving. At the very least, they are hoping to be able to continue sending items to the organization with Indiana State students who are studying at Universidad Veritas. "We want to sustain this throughout the years," Block said. "We don't want them to just feel like we're coming there once and they'll never see us again. We want them to know that we take interest in their lives." Photo: http://isuphoto.smugmug.com/Other/Media-Services/Austin-photos-020113/i-BHPKrkv/0/L/227056_10151283512567557_111439856_n-L.jpg (Submitted photo)Indiana State University students Lauren Hensley and Nick Penington; Andres Morera, sub-director of marketing for Universidad Veritas in Costa Rica; Indiana State student Monica Block, Paige Cornetet and Alejandra Barahona of Universidad Veritas; and ISU student Crystal Garcia. The Indiana State students collected items, which included donations from several organizations in the Wabash Valley, before traveling to Costa Rica to deliver them to Fundación de Misiones Mi Tia - Betel, which is in San José. 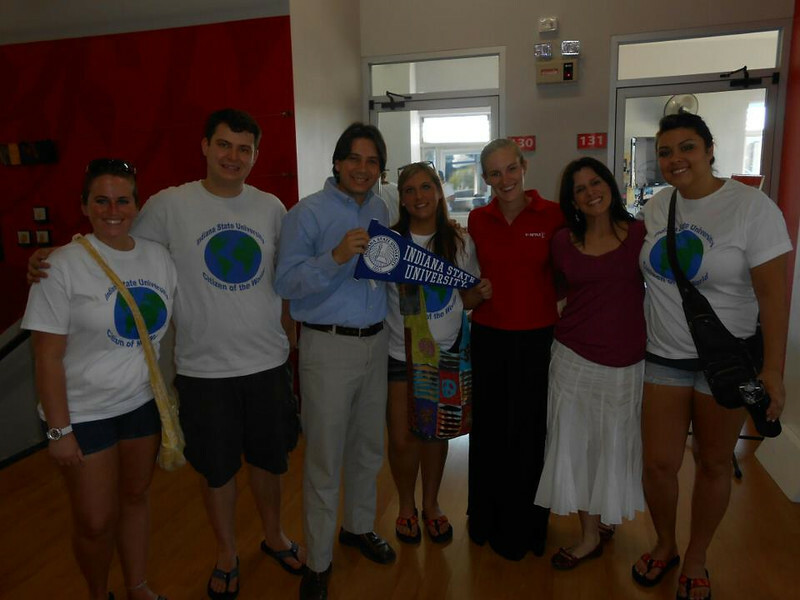 Some students at Indiana State travel to Costa Rica to study abroad at Universidad Veritas, which also features students working at the foundation. Photo: http://isuphoto.smugmug.com/Other/Media-Services/Austin-photos-020113/i-8sLBP9K/0/L/282892_10151282840412557_667435109_n-L.jpg (Submitted photo)Indiana State University students Lauren Hensley, Crystal Garcia (holding the passport), Monica Block and Nick Penington, who collected items for children at the Fundación de Misiones Mi Tia - Betel in Costa Rica. The Indiana State students also traveled to Costa Rica, delivering the items to the organization and spending two weeks volunteering there. Photo: http://isuphoto.smugmug.com/Other/Media-Services/Austin-photos-020113/i-FKQ9sMD/0/L/734366_10151297601692557_1057269383_n-L.jpg (Submitted photo)Some of the items collected by the Indiana State University students for the children at the Fundación de Misiones Mi Tia - Betel in San José, Costa Rica. Four students from the Student Study Abroad Organization collected items and traveled to Costa Rica to deliver the items to children of a foundation in San Jose. The group also spent two weeks working with children at the foundation.